Get ready to cause some turmoil on the lanes with the DV8 Turmoil Hybrid bowling ball. This ball pairs the Turmoil Symmetric core that is a modified Freakshow core with the Composite Hook Hybrid coverstock. 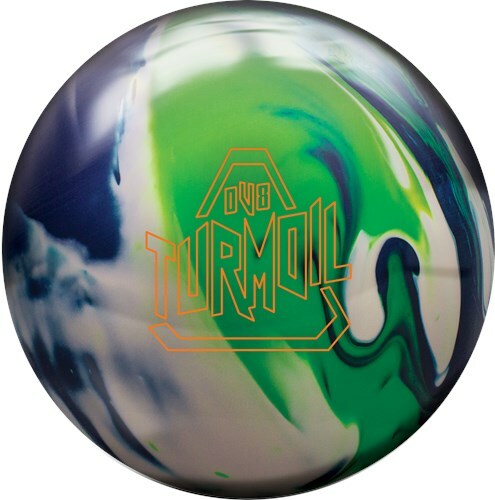 The Turmoil Hybrid has a unique look and is an all purpose ball for medium oiled lane conditions. The DV8 Turmoil Hybrid is the newest release in the mid price point of symetric balls. One thing the Turmoil line is known for is the most bang for your dollar at this price point, and the Hybrid version continues this! When I joined the DV8 staff, I had just missed the Turmoil solid release, but I do have a Poison that I use as my benchmark, and while they are 2 different lines, they have paired really well in my bag. Normally my Poison is the first ball I grab to get a read on the lanes, and the Turmoil Hybrid is a great step down when the Poison is too much ball. The Hybrid is great for me when the fronts start to go on your typical THS, or when theres friction outside or downlane. Those with heavy hand and slow ball speed will love the length and recovery this ball has. Speed dominant players will definitely have to adjust the oob surface, but with some minor adjustments, most can see a use for this ball in their bag at some point. My overall thoughts, I really enjoy throwing this ball when I can. I love the colors, and it is just a great looking ball that stands out when it goes down the lane. I really like the performance you get at this price point, it feels like a higher price point performance wise to me. If you need length and pop on the back, give the Turmoil Hybrid a look. Join Lane Side Reviews as they get funky like a monkey with the bestest little christmas candy ever, the DV8 Bowling #TurmoilHybrid. Don't be fooled by its fun exterior. This ball has some SERIOUS performance! Page created in 0.707 seconds with 21 queries.